Click on any picture below to see a larger image. All photos by Fred Hurteau. 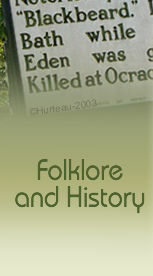 The photos on this page were taken circa 1972-73. 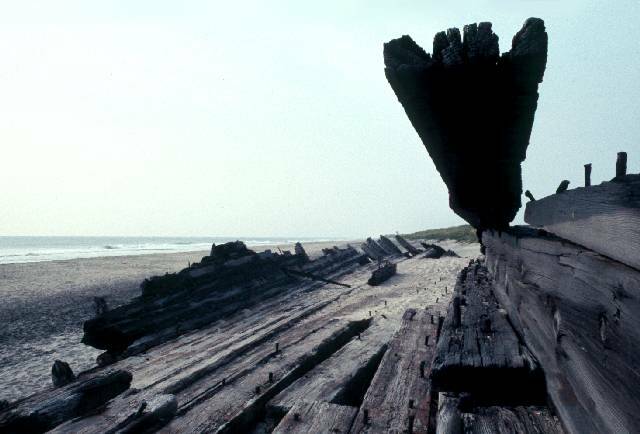 Some of these wreck sites are no longer visible but may reappear at the whims of the tides and sand. Some have washed away and disappeared altogether. Some are more visible now than they were when these photos were taken. 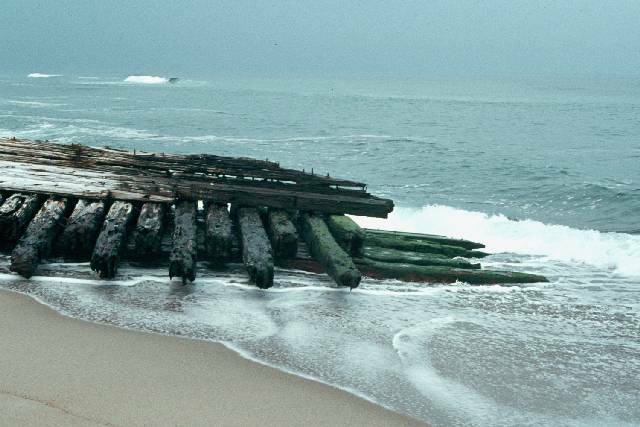 Such is the nature of these pieces of shipwreck history. Without GPS coordinates (something not available at the time of the photos) the location, and thus the likely identity of some of these is not known. On the other side of the coin, you never know what new surprises the tides and storms will bring to light in the near future - more pieces of history for us to ponder and wonder about. The G.A. 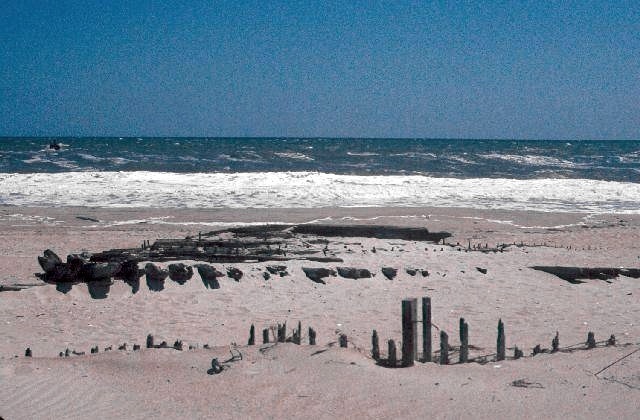 Kohler washed high up on the beach in a hurricane on Aug. 23, 1933. 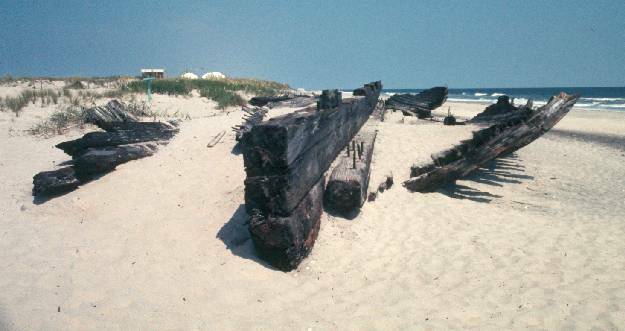 The huge 4-masted schooner languished on the dunes like a beached whale for nearly ten years. During WWII this popular tourist attraction was burned to obtain her scrap metal. 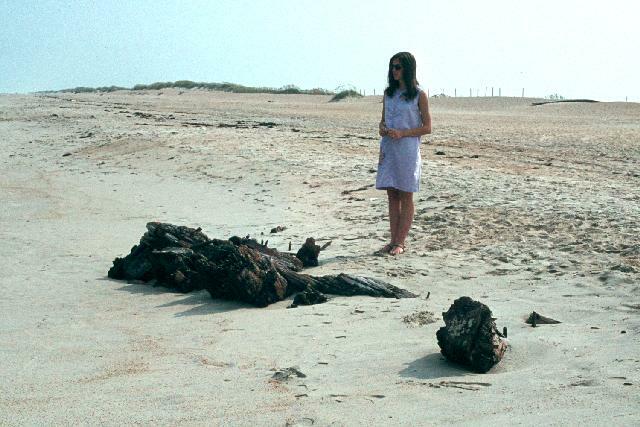 In 1973 when this photo was taken this was all that visibly remained. 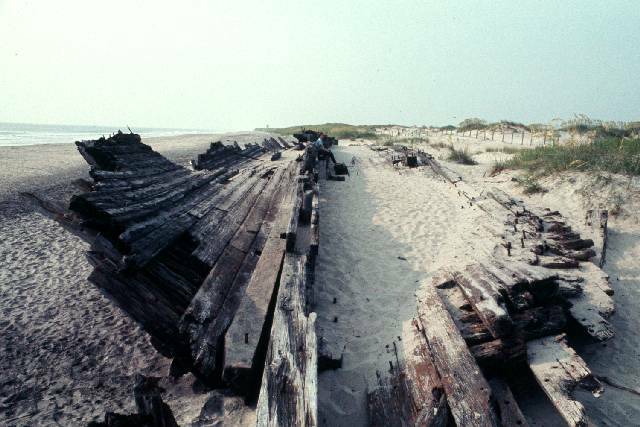 The Altoona (left) broke in two at Cape Hatteras point in 1878. 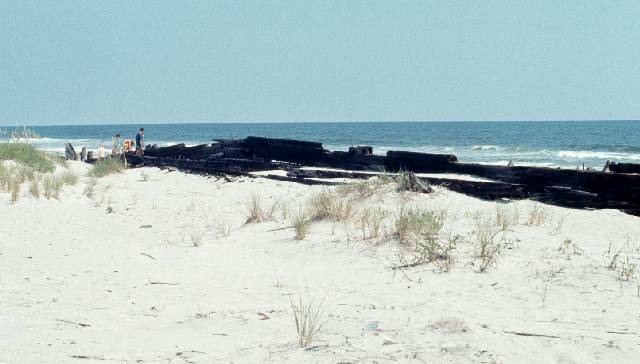 This piece of the wreckage is also visible in the background of the 1973 photo at right, showing another piece of the ship. 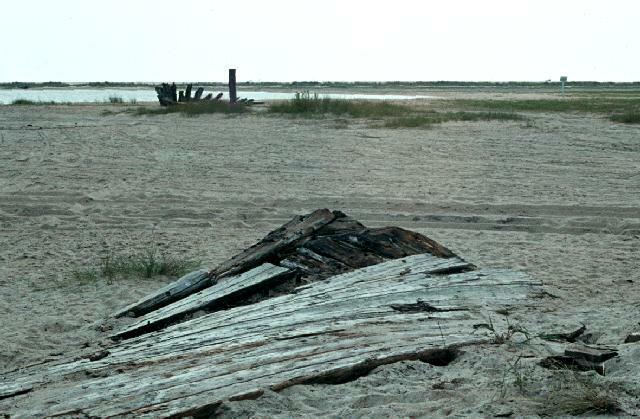 One source indicated this wreckage has washed away after remaining visible for more than 100 years. This is another photo of the Oriental seen on the previous page. 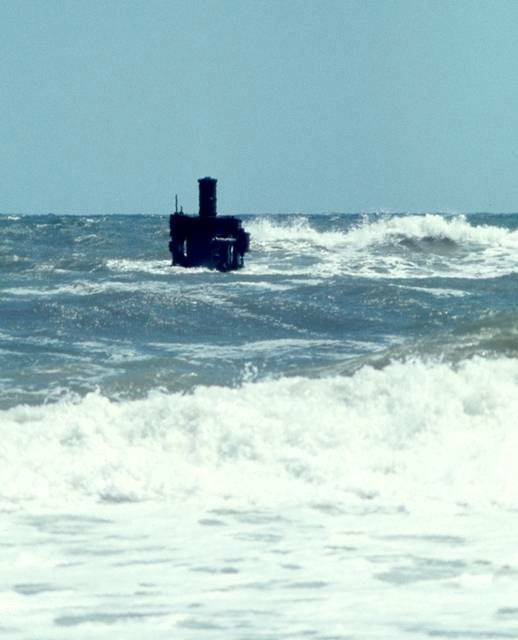 This enlargement better shows the boiler stack which has defiantly withstood the oceans fury since 1862. 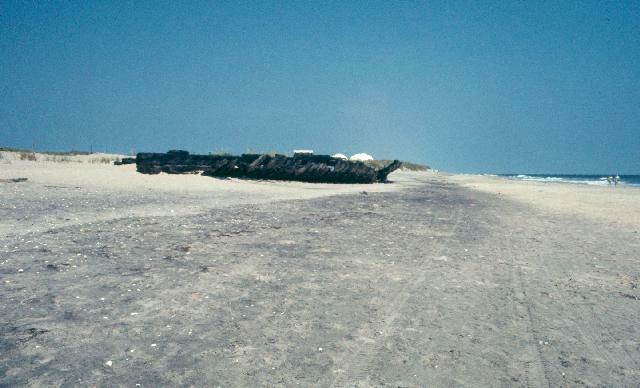 The unmarked shipwreck (at right) rests within sight of the Oriental (pictured above). 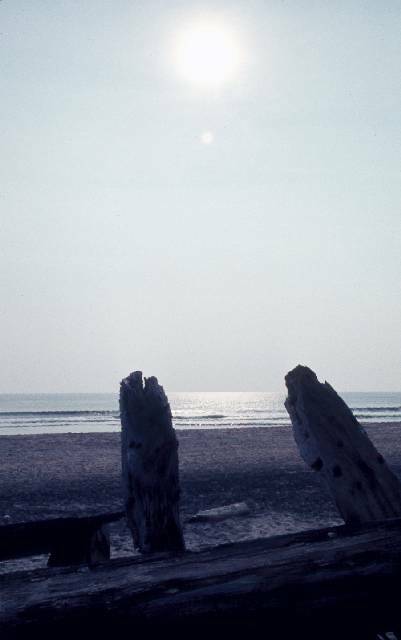 Click on this thumbnail and find the Oriental in the ocean at the far left of this picture. 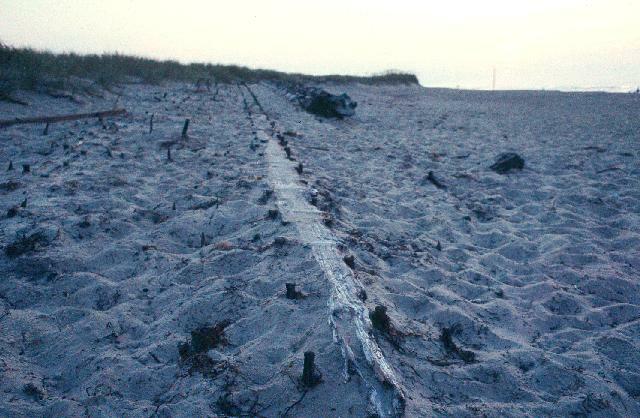 The spikes in the foreground are the remains of fencing used to stabilize dunes. 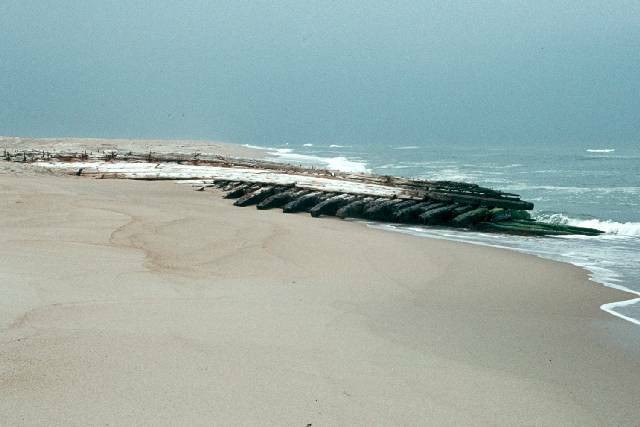 The three photos above are different angles of a wreck marked by the park service as the M.A. Spencer, but I have been unable to locate any references to a shipwreck by that name. 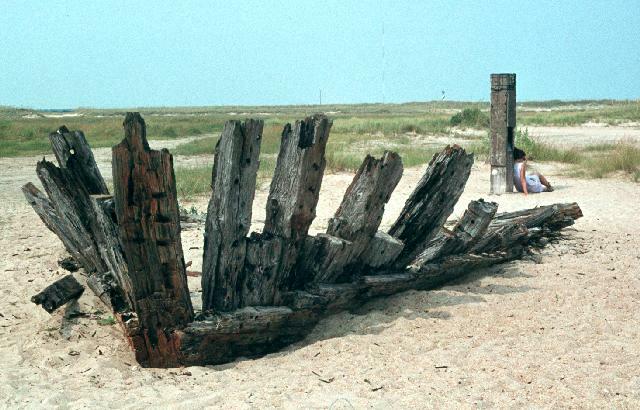 The photos at left and right are opposite ends of a shipwreck on Ocracoke Island believed to be the George W. Wells. 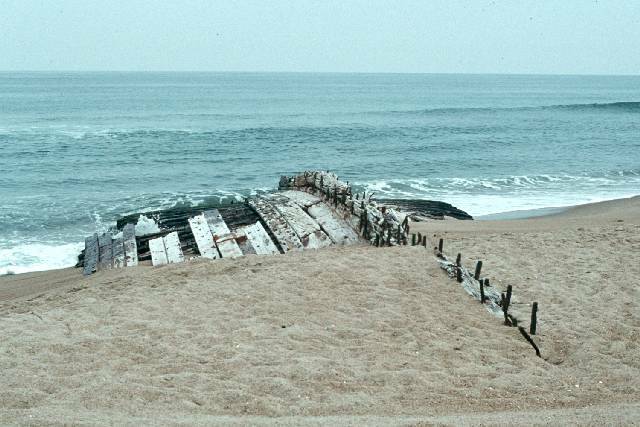 Although most of this wreckage was buried under the sand, it appeared to be as long as the remains of the Laura A. Barnes shown below. 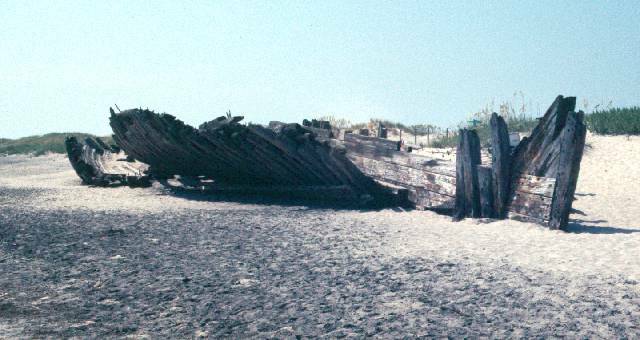 The Laura A. Barnes (at left, right and five photos below) was a 4-masted schooner out of Camden, Maine, that shipwrecked in a storm on June 1, 1921. 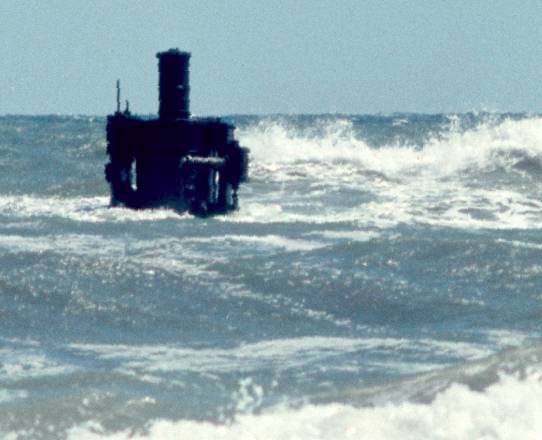 The crew was rescued and the stranded ship was sold to some locals for salvage. It was stripped and the salvage was sold at auction. 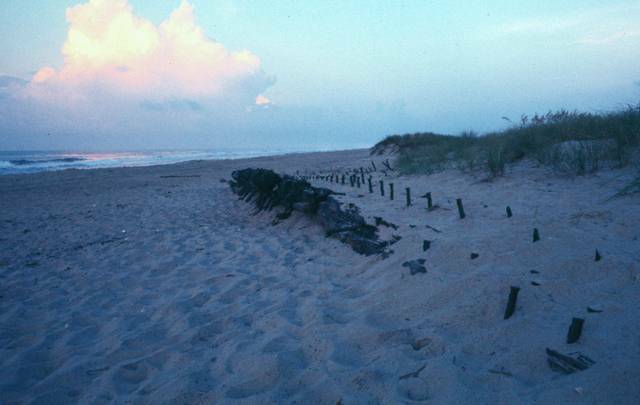 Parts of her went into building a house, which was a very common occurrence on the Outer Banks. Storms shifted the remaining wreckage about, and vandals have set fire to the hulk several times.